Share the post "Persian Lily Or Fritillaria Persica – Exotic-Looking Hardy Flower"
If you want to bring something really unusual to your spring garden, plant this exotic-looking hardy bulb. Fritillaria persica or Persian Lily is one of the easier and weather tolerant Fritillaries that can be grown in the garden. This flower has a delicate appearance, it is elegant and quite unusual. 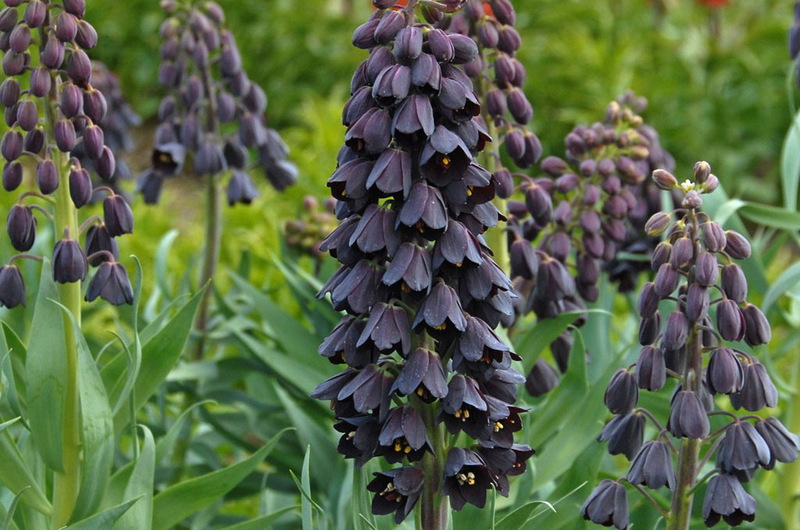 Black Persian Lily produces spikes of black bells, up to 20 per stem and the blue lance-like foliage tops off the unusual look of this stunning flower. Native to the western Himalayas and Asia Minor, it prefers rich, very well-draining neutral pH soil, good sunlight and a hot dry period over the summer. Unfortunately, due to over collection and loss of habitat this stunning plant is under threat in the wild. • From seeds. Sow in winter in vented containers, cold frame or unheated greenhouse . • By dividing rhizomes, tubers, corms or bulbs (including offsets). • Plant bulbs at a depth of 12cm (5 in) and 25cm (10 in) apart. Always handle Fritillary bulbs with care as they are fragile. Planting them on their sides will help to avoid water collecting in their hollow crowns and prevent the bulbs from rotting. Uses: Ornamental. Alpine ad rockery, Wildlife gardens, Woodland gardens, Cottage Gardens Spring Border. • Dislikes wet soil and won’t survive in poorly drained soils. • Great to plant in clusters of three or more for best effect, or blended with Fritillaria persica Ivory Bells. • The bulbs need to be grown to a seriously large size before they are mature enough to flower. • Prefers good sunlight and a hot dry period over the summer. • Bulbs are composed of few fleshy scales and are intolerant to bruising or prolonged periods exposed to the air. Handle them carefully. • Protect Fritillaria persica bulbs with about 2 inch layer of mulch (applied after the surface of the ground freezes) from winter temperature spiking if there is an inconsistent snow coverage. • Surround Fritillaria persica bulbs with coarse sand to help drain excess water away. • Persian lily is prone to slug and snail damage on emerging growth and so will benefit from a mulch of sharp grit to deter them. Do you grow Fritillaria Persica (Persian Lily) in your garden? What is your experience with this plant? Please share with other fellow gardeners in the comments below! Do you sell Fritillaria Persica (Persian Lily) seeds or have plants for sale? You can place your advertisement here. Contact us now!